Three years ago David Florence won an Olympic silver medal on the white water course of Lee Valley in London - this week he returns to the venue eyeing not one but two world titles. Two years ago at the worlds in Prague he succeeded as he won gold in both the C1 and C2, and this year's World Championships hold extra significance. Despite not acting as qualifiers for the Rio 2016 Olympics for individuals, they do present an opportunity to qualify one boat in each of the four Olympic classes - the C1 Men, K1 Men, K1 Women and C2 Men. The final athlete selection trials for canoe slalom will be held over the weekend of 24-26 October. Three other Scots join Florence in the 14-strong Great Britain team this week in London: Fiona Pennie, Eilidh Gibson and Bradley Forbes-Cryans. Florence believes he's in good shape going in to this week. He said: "The form's been good and I've been on the podium at a couple of world cups. Florence will compete in both the C1 and C2, the latter with Richard Houslow, with whom he won Olympic silver at London 2012. In terms of the C1, Florence believes his major challengers hail from Eastern Europe. On preparing for his events, Florence admits the early part of the race is key for him. "The Slovaks are very strong with the likes of Benjamin Savsek - he's very fast," said Florence. "I focus on the first few gates, getting the first bits right. My aim is to put down the best run I can. "I'll just be focusing on what I'm trying to achieve and where I'm trying to put the boat. Trying to get those strokes right." 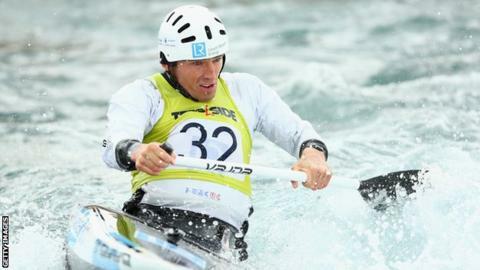 The World Championships return to the UK for the first time since 1995 and not long after last year's Canoe Slalom World Cup. Having experienced home support during the London Olympics, Florence is expecting them to play their part this week. "It's going to be really nice, it's really enjoyable to race with a home crowd with a good atmosphere," added Florence. "And we do see that home athletes on home water do seem to perform slighter better than you would necessarily expect so hopefully it can play in to my hands a little bit." Competing in front of a home crowd is something fellow Scot Pennie is also looking forward to. "A home crowd would be amazing behind us," she said. "At the London 2012 Olympics, the C2s getting gold and silver, it was great for them and we would love that support all the way down the bank." Pennie, 32, will compete in the K1 category, and despite missing out on the team for London 2012 she bounced back by winning gold in the European Championships the following year. However, the build-up to this year's championships have not gone as well as she would have liked. "It's not been a great season I have to say," she said. "The Europeans didn't go to plan and the three World Cup races out of the five I did also weren't great for me. "Kim Woods and Lizzie Neave will both be tough contenders for me. The place for Rio will be decided over that weekend in October so that will be tight and it will be about whoever keeps their head in the game on the day."